The first Nationwide Representative Congress of Ethnic Minorities in Vietnam opened on May 12 as the country actively prepares for the 120th birthday of President Ho Chi Minh; therefore, his message of the spirit of solidarity must be kept dear to the soul, said Party General Secretary Nong Duc Manh at the congress in Ha Noi’s My Dinh National Convention Center. A nationwide congress, the first of its kind in the 35 years since national reunification, will include representatives from all 54 of Vietnam’s ethnic groups. Some 1,702 outstanding delegates representing the more than 12 million ethnic minority people joined the first congress, displaying their spirit of solidarity with the country’s growth. The oldest representative is 103-year-old Thao Khua Chinh of Mong ethnic minority in the northern mountainous province of Son La, a senior veteran who battled the French troops. 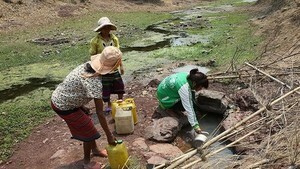 Despite his advanced age, he actively participates in social activities within his community. Meanwhile, the youngest delegate is seventh grader Lo Van Thoa from the Odu ethnic group, who said he must strive to learn all he can, in order to become a good teacher and thus, able to impart important lessons to forthcoming generations in his community. Giang Seo Phu, The Minister and Chairman of the Committee for Ethnic Affairs, stressed ethnic groups should continue enhancing solidarity, which helps to build and develop the country, praising the great contributions ethnic minorities have made in the causes of national construction and protection. Moreover, under the leadership of the Party, government, and efforts made by each ethnic minority group, socioeconomic conditions have improved greatly, Phu said. However, he added that the rate of poor households among ethnic minorities is still high compared to the country in general, but that currently, infrastructure cannot meet production requirements, due to a severe shortage of qualified personnel. The Party General Secretary Manh stated the Party and the government have allocated funds to support the development infrastructure, educational institutions and the healthcare system in the mountainous regions, although these areas still struggle to eradicate poverty. Mr. Manh called on ethnic groups to enhance their spirit of solidarity, increase their awareness of Party policies and to aid the government in constructing and developing the mountainous areas so that their communities may improve on par with the nation’s overall progress. He said ethnic minority organizations and agencies should enhance their spirit of solidarity and encouraged them to participate in the nation’s love emulation movements, as well as to practice Ho Chi Minh’s teachings, which emphasize the great need for national solidarity, a crucial element of the revolutionary era as well as for the sustainability and development of the nation’s future. Party General Secretary Nong Duc Manh, Prime Minister Nguyen Tan Dung, National Assembly chairman Nguyen Phu Trong, the chairman of the Vietnam Fatherland Front Huynh Dam, former president Tran Duc Luong, former Party General Secretary Do Muoi and representatives of ministries, senior veterans, heroes of the people’s armed forces attended the meeting. 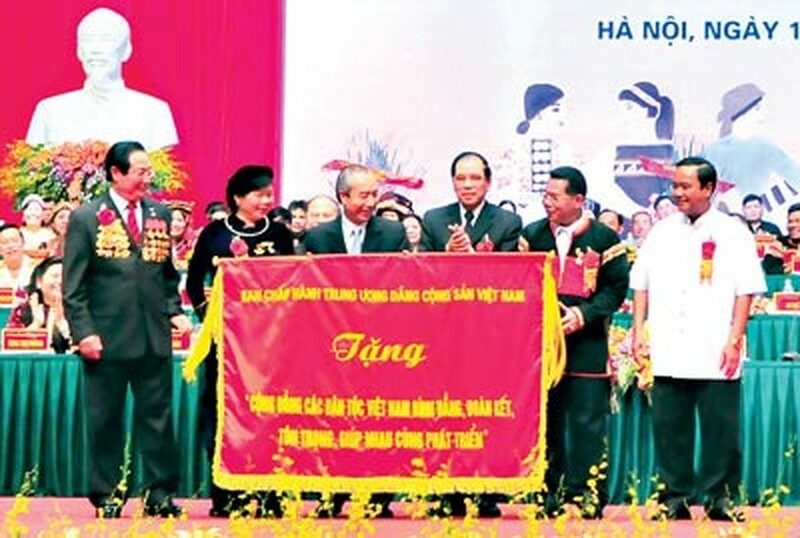 State President Nguyen Minh Triet, former Party General Secretary Le Kha Phieu, former president Le Duc Anh and General Vo Nguyen Giap sent flower and letter to congratulate the success of the meeting.